One of philosophy's traditional purposes was to question the meaning of life, a mission currently enjoying a resurgence of interest among analytic philosophers. As much a guide as it is a reader, this anthology features astutely chosen essays that define the context of this historically core philosophical imperative. Blending classic treatments by thinkers including Epicurus and Bertrand Russell with the best contemporary commentary, its thematic structure mirrors the nuanced dialectical terrain of the current debate and extends recognition to the contributions of literary figures such as John Updike and Samuel Beckett. Blending classic treatments by thinkers including Leo Tolstoy and Albert Camus with the best contemporary commentary, its thematic structure mirrors the nuanced dialectical terrain of the current debate and extends recognition to the contributions of ancient sacred texts in the case of Ecclesiastes and even science. An extensive general introduction orients the reader to the historical, experiential and conceptual aspects of the subject, and anticipates likely developments. In addition, each section is introduced by internationally respected philosophers who have themselves made vital contributions to our understanding of the meaning of life, while a wealth of references and suggestions for further reading provides students with a valuable tool for extending their knowledge. 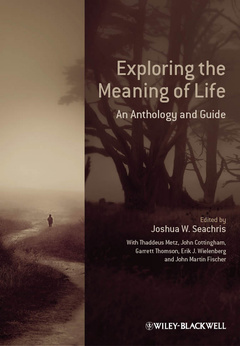 Exploring the Meaning of Life: An Anthology and Guide is a comprehensive survey that shepherds readers to the frontiers of modern philosophy at the same time as charting the roads taken to get there. Joshua W. Seachris holds a doctorate in philosophy from the University of Oklahoma. He is Adjunct Assistant Professor of Philosophy at Wake Forest University in North Carolina, as well as Grant Administrator for The Character Project, which aims to map the contours of the human character by funding key research in philosophy, psychology and theology. He is the author of peer-reviewed articles on a range of topics in philosophy, including the problem of evil, Confucius and virtue, the meaning of life, and death. His work has appeared in the International Journal for Philosophy of Religion, Asian Philosophy, Philo, Religious Studies, and the Internet Encyclopedia of Philosophy.